Guess What’s Back. Back Again. And, a GIVEAWAY ! Guess what’s back, back again. Anniversary Sale is back. Tell a friend. But, for reals, it’s that magical time at Nordstroms again. Since, Nordis is my favorite store to shop at – hello customer service – why wouldn’t I be excited to shop fall fashion at a discount?! Wait. Wait. Wait. It’s a 100′ outside so it’s super hard to imagine layers, on layers, on layers. But, nothing gets me more excited than boots over jeans and bundling up in scarves over sweaters. Yup, you guessed it : fall is my favorite! Sorry summer, I love you mucho, but you make me a little too sweaty. However, I do like my tan, thank you very much! In anticipation for this glorious sale, I am giving away some money so you can shop during this AMAZING sale!! I am so excited to be teaming up with a few of my favorite LIKEtoKNOW.it bloggers for this GIVEAWAY! 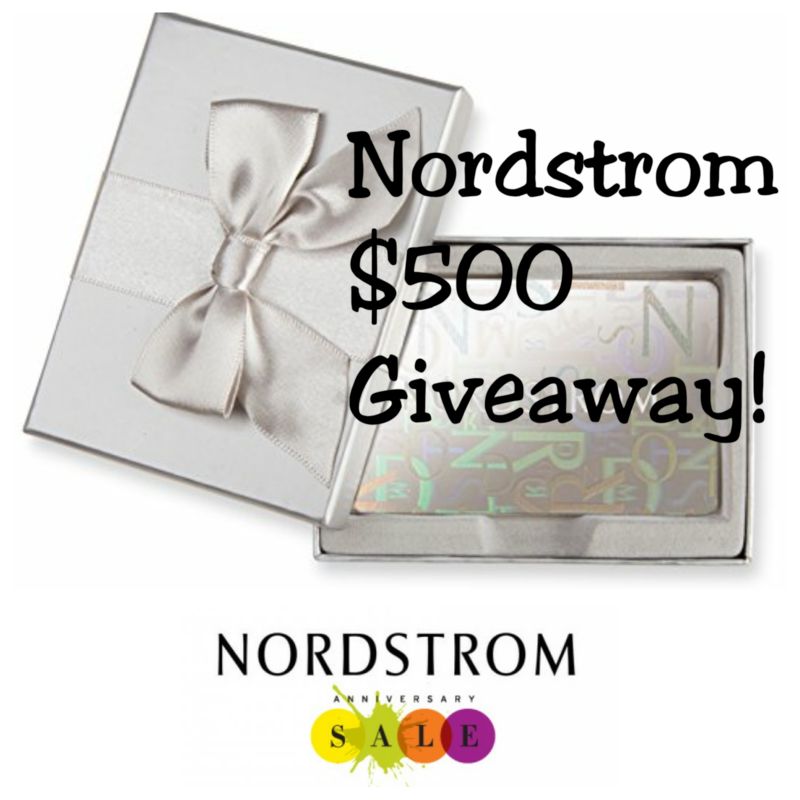 One lucky follower will win a $500 Nordstrom e-gift card just in time for this major sale!!! All you have to do is click on the link below and follow the directions to enter! And don’t worry we are not making you follow 20+ bloggers- it is a short loop! Click here or the above photos to enter. You must subscribe to each of our blogs and follow us on Instagram in order to complete your entry! The giveaway is open to US residents only! Your Instagram profile needs to be PUBLIC to win. Do NOT DM or Email giveaway hosts or you will be disqualified! This giveaway will run from July 11th 12:00am CST until July 15th 12:00am CST The winner will be chosen randomly and will be announced on 7/15/17. Hey girl! I have been searching relentlessly for your subscribe link and I can not find it on your website anywhere. I figured it wouldn’t hurt to reach out to you to figure out where it is at. 🙂 Thanks!!! Thanks so much for bringing this to my attention! Holy Moly! It should be fixed now (no idea why it disappeared?). Please see the right hand sign underneath the sketch and socialize buttons. If there are any more questions please let me know. Of course! So glad you got it all figured out. 🙂 I am now subscribed. Thx for fixing it!!! Hoping this will subscribe me by email. I do not see another place to subscribe. I was having issues with my Subscribe Now button this morning. It should be fixed now. Please see the right hand sign underneath the sketch and socialize buttons.